When this writer worked in Kosovo, attempts to interview people from the small community of Serbs that remained there after the European Union took over the city almost invariably failed. The Serbs were afraid to talk. Even a well-known journalist just clammed up when asked about the future of the Serb community in an independent Kosovo. So it is good, almost exactly three years after Kosovo declared its independence from Serbia in February 2008, to see this publication by a Serbian intellectual with very outspoken views on Serbia, Kosovo, and the Balkans in general. The book provides a vivid inside view of Balkan politics, and is clearly required reading for anyone interested in the region. The 35-year-old author, Andrej Grubačić, is a leftist social activist, and a founder of the World Social Forum, a kind of annual anti-globalization fest. Mr. Grubačić is really interesting when he describes local politics, Belgrade intrigues, deals, corruption—all of the insider info that completes our understanding of Serbia and its neighbors. Mr. Grubačić is unbearably dull when he gets into macroeconomics, anti-globalization, and idealism. Whatever one’s position may be on issues like globalization, one has heard all that the author has to say on this subject before—been there, done that. . . . If that kind of thing grabs your imagination, then you will find a wealth of it in this book. Perhaps the reader should consider, however, that until a few years ago, these people at the “bottom up” from which Grubačić’s new society would be built, had to be forcibly prevented from slaughtering each other. NATO’s intervention in Kosovo—where it still maintains about 8,000 troops—is viewed by Mr. Grubačić as an aggression against Serbia (the incredibly silly preface to the book talks about “American colonialism,” apparently forgetting that Kosovo is administered by the European Union, although such commentators think the E.U. is just an extension of the U.S. . . .). In Kosovo alone, 6,000 ethnic Albanians were murdered by Serb forces. After the E.U. took over Kosovo, the Albanians “ethnically cleansed” about 1,000 Serbs. The Serbs also suffered in Croatia’s war of independence, in which vast numbers of Serbs were brutally executed. The atrocities of Serbs in the Bosnian war are well known. This does not sound like the basis on which to form a new community based on social experiments in popular cooperation. The trendy citations included from the fascinating French Jewish philosopher Emmanuel Levinas are nice, but do nothing to advance Mr. Grubačić’s cause. Why drag him into this mess? Fortunately, there is a lot more in the book than this idealistic blather. Where Mr. Grubačić is really good is when he is giving us the goods on the people and events that have shaped the Balkans. The assassinated Prime Minister Zoran Djindjić is described as “a victim of his own alliances with organized crime.” When the vice president of the government declares, “Being a democracy, Serbia requires no opposition party,” Mr. Grubačić has a good laugh at him, and at the government’s shameful use of emergency powers. There is an extremely clear and detailed exposition of how former President Slobodan Milošević, who died in prison at the U.N.’s International Criminal Tribunal for the Former Yugoslavia Hague while being tried for crimes against humanity, consolidated his power in the country. 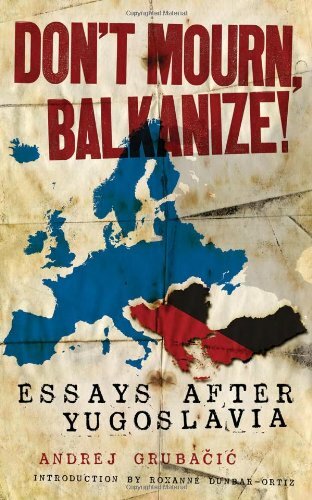 You can learn a lot about the Balkans from this book, so it’s worth the slog through the banal anti-Americanism and knee-jerk leftist politics to get at it. Incidentally, the word “Balkan,” according to the OED, started out by referring to the mountain range of that name, and later to the region defined by that mountain range. Only later did it begin to refer to the countries in that region, i.e. the “Balkan States” (Fortnightly Review, 1891). It has never been used to define a people; there are “Albanians” and “Slovenes,” but there are no “Balkanites.” Since everything in the region seems to be pulling in the direction of ethnic self-determination, the proposal to create a kind of spiritual Balkan union seems to us, in all humility, to be pure fantasy. But readers can surmise what they will.